January 19th at 11:00am til whenever at the Dunkin Donuts in Hiram, Ga. Come one, come all air cooled and water cooled Vdubs. There is a large parking lot directly behind the Dunkin Donuts. Come hang out with fellow VW enthusiasts til you get tired or run off. Monthly meet on third Sunday each month. It's time to eat some donuts in the morning. I'll eat donuts all day lol!! Newbie gonna be there to join the club are there going to be any t shirts or hoodies available ? Sgt. Carter (Kale) would be the one to see about that. Dang Patrick, I hate to hear that. I hope you get better soon. See you at the next one. I hope your better soon. Thanks guys. From what I hear I should be all good in about 4 weeks. Great turn out. Beautiful day for it. Thanks to everyone for coming out. I enjoyed hanging out with you guys. I'm looking forward to the next one. Appreciate all of you for coming out and making this a good turnout. Hope to see more Ga Dubbers at next one. I need to get some of these fliers. Having some printed tomorrow Tim. Need Everyones Help Sunday. 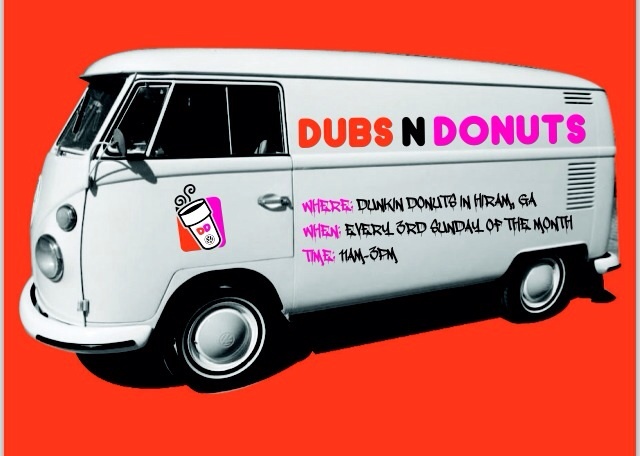 This Sunday is our Dubs N Donuts get together one week before Cruise The Coop. I am asking if everyone could possibly join me on a early departure from Dunkin to the camping area for Cruise The Coop. I want to get as many cars over there as possible so we can measure space in case there is a Plan B for camping area. In the event there is rain within 5 days of camping we will have to have a different set up at camping area and i need 10+ Cars to test the area space for a Plan B if there should be one. Thanks In Advance. I'll be there for ya Kale. If theres rain on Sunday we will no be going to the Camp Area from Dunkin. Going to have to miss this one guys. Gotta work this weekend, so I can be off next weekend. Not this weekend. Have to get them to you during the week. bakertim2 wrote: I'll be there for ya Kale.